We have used these cleats for years and they are an easy on and off device that makes it safer to be out in less than great weather and frozen conditions. I have used these for over 15 years. They grip ice so well that I have not slipped or fallen even once while wearing these ice treads. 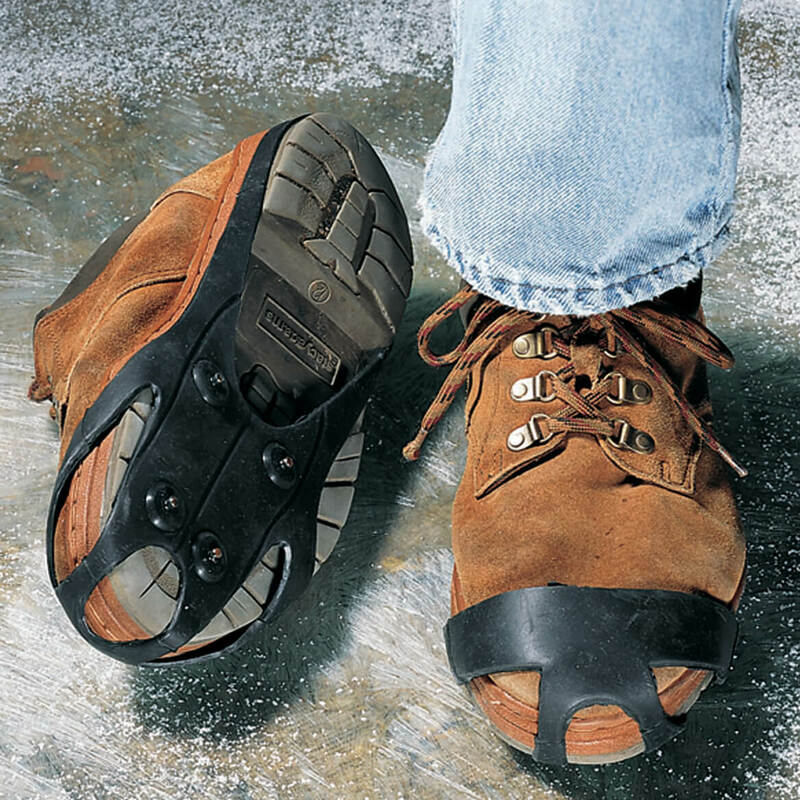 I have purchased these many times to give to people who have trouble walking on ice and packed snow. I have never received a complaint from other users. These work great on the ice and snow. Bought for Aunt, she loves them they really help her when she takes her trash out & gets the mail. She feels more secure in her footing. I have a pair of these in the car, in my office, in my room in NJ and in my apartment in MD. I've given them to my friends who also love them. I have a real fear of slipping on ice and have never fallen while wearing these. I also have a couple pairs that have heel protection for the really, really bad ice. They are larger, bulkier to store and more difficult to put on, but work. For the price, you can't beat Winter Ice Treads!! I walk with confidence with Ice Treads. In cold Wisconsin winters, we have lots of ice and lots of slippery falls with injuries. I carry my Ice Treads in my purse or pocket and easily slip them over my shoe or boot and feel safe. these are so nice to have when the ice comes and I need to be out, abit clumsy to get onto boots, but worth the struggle to feel safer. I have bought and given--love them! I wore out the first pair, ordered some for myself and more to give away which were greatly appreciated. Easy to carry in the plastic bag in a pocket. Will always have some handy. I finally have a way to walk on icy surfaces. I'm thrilled to find them. i walk to work so. the ice treads ready help. and of course they do there job. Great product for anyone living up north or dealing with snow, ice, sleet, etc. Great for added traction over your boots or shoes in winter weather. These are GREAT! People see me and want their own! Particularly good after freezing rain puts ice on top of snow, a typical pattern here in Oregon. There are front & back indicators to remind you if they are used infrequently. Once they are adjusted to your shoes, they slip on and off easily- best when sitting down. Makes walking more secure when carrying grocery bags to and from your car or mail from your outside box or walking your dog. These fit just fine and really work. We had tons of ice over snow so these came in handy. Glad I got them. I actually bought these last year but never used them until a couple of weeks ago. With all the snow and ice we've had recently, I dug these out and put them on my snow boots. They went on easily and snugly and haven't fallen off yet. They aren't as heavy duty as some other famous ice grippers for long hikes on icy hills, wooded trails and roads, but they aren't $20+ either. I do wish that they had the studs in back and not just under the balls of your feet, but for the money, they're pretty good for trips to the mailbox, to the car or where ever. Just remember to put most of your weight on the fronts of your feet and not your heels. I will buy this item over & over again. 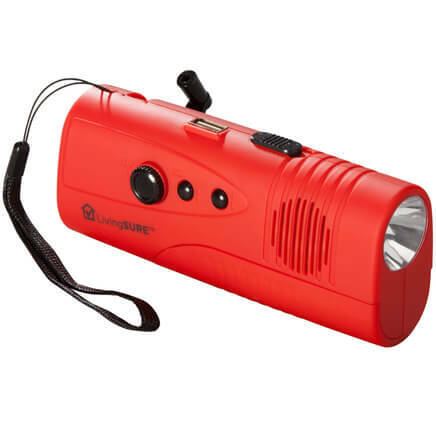 I use this item when there is ice or snow on sidewalks, parking lots, driveways or roads. This has saved me from falling numerous times. Can't always see black ice. They might be bad for wood floors but it's better than breaking something. Sturdy and quick to put on, I'm keeping a pair in the car and one at home to be ready for ice at all times. Great, just what I was looking for.. When the temperature is very low and there is ice on the road, this will keep from slipping while I walk and save from maybe breaking a leg. I actually helped my neighbor to get this item as it is a great help to prevent falls when it is icy. I walk my dog twice a day. The ice on the streets and sidewalks is really bad this year. When I have the ice treads on I don't slip. Every winter I have fallen at least once, so far this year no falls. Helps prevent a fall on the ice! We live in a winter climate and the driveway gets icy. That's when I slip the ice cleats on my boots and enjoy a safe walk to the mailbox or garage. A couple of the pegs fell off under the cleats, but I still get protection with the remaining pegs. What an inexpensive and easy-to-use way to increase your safety on ice and snow. These ice treads slip over your shoes so quickly and really grab the snow and ice to help keep you from falling. My husband, my kids, and I all have a pair to keep in the car. [@] sells something similar, but they are more expensive and harder to put on. BOUGHT THEM FOR A FRIEND..
work great,but could use more "spikes"
I bought these for my parents for fear of them falling on the ice. They both use them...love them and they work great for them. Being in Nebraska you get a lot of ice storms and these just eases our minds. These things are great. I have actually purchased 7 or 8 pairs and given as gifts. They are great to carry in your car or purse in case of unexpected ice. If they prevent falls due to slipping on ice they will be perfect. We frequently get icy sidewalks and roads in Maryland. Wearing these keep me safe when walking. The only down side is the rubber wears out after some years of use and one of my treads broke. I like them so much, I bought another pair. There great when using my snow blower. I have a large dog that has to be walked 3 times a day which is difficult in icy weather. These ice treads help keep me from slipping when the dog pulls. Easy to put on and fits over any shoe. Easy to put on or take off. On a weekend trip to the mountains, this product worked well in slush, one inch of snow and more. Of course I still had to be a little careful. I'm glad I made the purchase. Winter ice treads help with slipping on the ice but there are no spikes on the heals. Difficult to pull on over shoes. Don't stay on my boots! Great idea - if only they held up! We bought two pair. 1st pair lost a clip during first outing. 2nd pair broke while being put on for first use. We purchased Mens size and they busted going on a size 11 mens boot. Very poor quality - We wasted our money on this one. broke the first time they were tried on. Don't waste your money on these. I have not had to use these on icy surfaces yet, but can't see that they will work. I think these are not true to size as described either. I wear a womens size nine shoe so I ordered the mens to make sure they would fit. I had such a difficult time getting these on over my shoes! They caused the shoe to break in the middle of the sole. I was wearing my Skechers and now they are ruined. Broke ar seam while putting on shoe for first time rendering it useless. Winter Ice Treads - don't bother! Unfortunately the ice treads broke the very first time I tried to use them. Miles Kimball refused to give me a refund because the item was purchased more than 45 days ago. Disappointing that the company will not do the right thing and issue a refund. There are days I need to go out and there is ice or frozen snow and I am afraid to go out. Using this product will allow me to go out and not be a prisoner in my own home. Winter ice and slush make walking outside with the dog difficult. At my age I can not afford to fall. I am hoping this works well. I'm 78 yrs young, still like to get around but, walking on snow and ice is hazzardous! These winter ice treads are perfect and give me con-fidence when walking. Love the convenience of ordering on line. Easy Peasy! I had purchased these MANY years ago and was surprised that they're still available. I hope that they are still of the same quality and still last as long, especially after reading the comments of some of the other purchasers. An item as important as this one is for accident-free walking on ice should be of the highest quality! If they are not, I will return them immediately. Repeat purchase. I wanted another pair. They keep me from slipping and falling at 10 p.m. with a temperature of -10 degrees. These are my go to treads for xcountry ski boots and snow hiking boots as well as just walk in town. They are easy on and off and easy to pocket and they GRIP WELL on ice. Wish they lasted longer, but they are only good for one to three seasons, but I still much prefer them to any other product I’ve tried. For older Gentlemen in Ohio were they have lots of snow. I fall too many times. I'm hoping this will lessen my falls. During the winter, we have mostly freezing rain followed by snow, which makes walking extremely treacherous. These worked very well, although I wish that they also provided cleats on the heels rather than just the toes. Know someone who needed to have something so she wouldn't fall. I live where it gets icy and I need something like this to get my mail. They are terrific on icy. My husband fell on the ice and cracked his head. He is 72 yrs. and can't afford falling. They work great for him, he walks everyday. ladies I work with asked me to find them some of these. you never know when you might hit ice! I have a couple pair of cleats and they work GREAT on the ice and snow. I thought I would give these a try for the price. I have a pair and like them. My brother has a dog and ha to take him outside even if it is icy. Out of necessity due to the amount of snow we've been getting here at our new address. Love Miles Kimball. Thank You. Owned these in the past, they lasted for years and were easy to get on and off. They were mostly effective unless you walk on your heels. They are great to have on your boots and shoes.Very easy to remove,I like that. So I won't slip when walking on ice!. my daughter needs some help walking so I'm getting these for her to try. We have ice and snow in ND and I want to be ready in case I need them. Have used before. Very useful! I'm a California transplant into Idaho. It snows a lot here and I needed something to prevent me from slipping on the ice...which I have already done once. These are great and I feel so much safer now. They really work well. 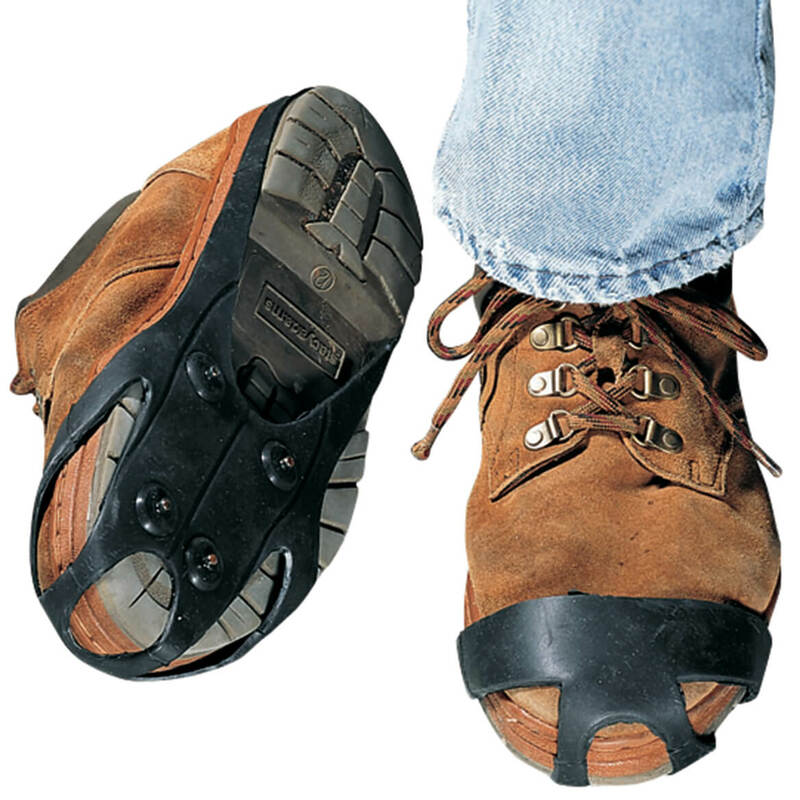 these have proved to be VERY helpful, making walking much safer on ice, slippery surfaces! My job does not always clear the parking lot well and I surely don't want to fall and break a hip. We needed a few more pairs of these in case we have more ice to deal with this Winter. They are very helpful when it comes to black ice I can actually walk without falling. So neither my husband nor I will slip on ice not taken care of with the rock salt used by our apartment complex as a safety measure. Giving them to my son. seems size has to be adjusted upwards. have you done so.? My husband and I have used the snow grabbers/ice cleats for years and like them very much. Not that you can go out and run across the ice but they have saved my bacon countless times simply walking across a slick sidewalk or parking lot. The rubber stays flexible and they hold up pretty well, eventually you may lose a spike but I still walk with confidence using the remaining spikes, we usually keep spares on hand. 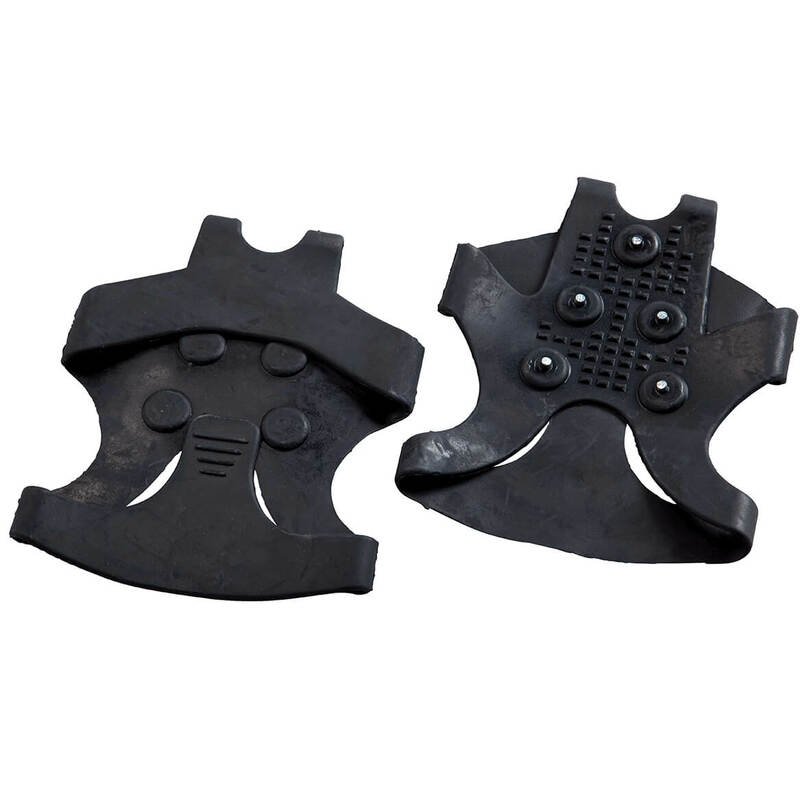 I wear woman's size 10 and my husband a men's 8, we found the Men's size Large ice treads are easier to put on compared to size Medium, we have used both sizes in the past and prefer the larger size. I hope this helps. No. I order the woman's and they fit great. They are so helpful on ice. I feel very confident when I wear them that I'm not going to fall.